The White-rayed pentachaeta is a California endangered plant species believed to now survive in just a few locations, one of which happens to be in our own backyard. This surviving patch is found west of i280 in the area called “The Triangle” adjacent to Edgewood Natural Preserve. 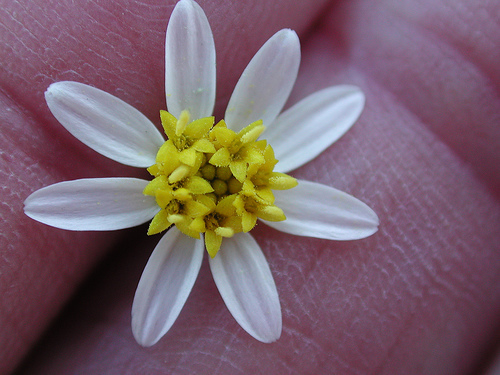 This pretty wildflower is a small annual, grown from a slender tap-root, with white, daisy-like flowers that typically bloom from March to June. The white-rayed pentachaeta is one of two endangered plant species, along with the San Mateo thornmint, that will be targeted for restoration as part of Project 467, the Friends of Edgewood’s comprehensive habitat management program initiated in 2018. White-rayed pentachaeta’s green leaves measure less than 4.5 cm (1.8 inches) long and one millimeter wide, are narrowly linear and fringed with tiny hairs (ciliate). The sparsely hairy stems are 6-17 cm (2-7 inches) in length and green to reddish in color. The yellow and white corollas have five lobes and each of the 16 to 38 round florets has linear, acute styletips. Urbanization and development have caused the loss of most white-rayed pentachaeta habitat, which once was found from Marin to Santa Cruz counties. The serpentine grasslands at Edgewood Natural Preserve offer an ideal location to promote restoration of the species, but threats from climate change, nitrogen pollution from the nearby highway, and invasive, non-native grasses and weeds mean that we do not have time to waste in protecting the few remaining stands of one of California’s most charming wildflowers. The Friends of Edgewood Park in collaboration with Creekside Science is doing preliminary analysis to determine how we might best embark on restoring our population of white-rayed pentachaeta. If you would like to contribute to saving the white-rayed pentachaeta at Edgewood Natural Preserve, please make a donation to Project 467 and help us protect and restore this fragile endangered species.